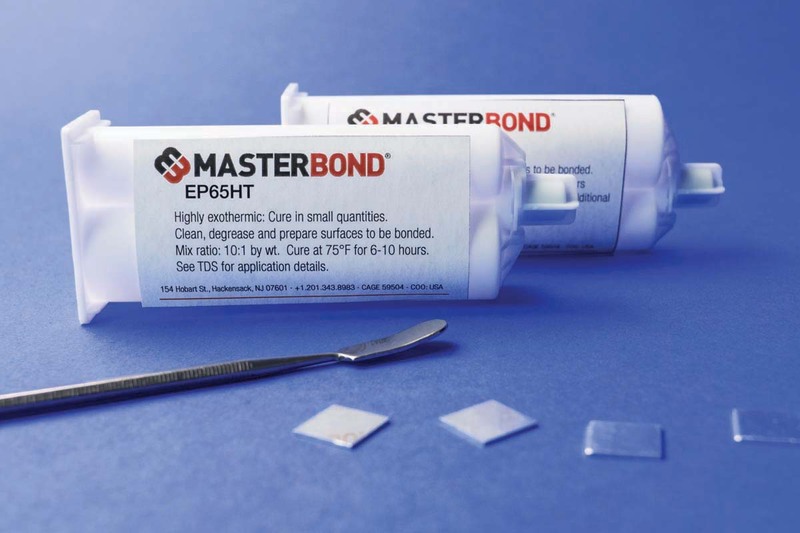 Master Bond EP65HT is a specialty type system that features the unusual combination of ultra fast curing and high temperature resistance. While typical fast setting epoxies normally possess glass transition temperatures (Tg) below 85°C, EP65HT has an exceptional Tg of approximately 125°C. In addition, unlike typical fast cure epoxies, EP65HT retains fast setup times even when mixed in relatively small masses. EP65HT normally will setup in 9-12 minutes in 10-20 gram masses. A full cure generally occurs within 12-18 hours with high tensile shear strengths of over 1,200 psi. This system offers good physical properties, including low shrinkage upon cure, excellent dimensional stability and a high tensile modulus. The service temperature range is -60°F to +400°F. EP65HT offers sound electrical insulating properties and a useful chemical resistance profile. EP65HT fully meets the NASA low outgassing specifications and is particularly well suited for vacuum applications. EP65HT bonds well to a wide variety of substrates including metals, glass, ceramics, vulcanized rubbers and many plastics. Dispensing EP65HT can be greatly facilitated by utilizing a dispensing gun capable of mixing fast setting materials with a ten to one mix ratio. This system is 100% reactive and does not contain any solvents. Part A is clear, and Part B is dark brown in color. It is especially useful for both prototyping and manufacturing in the aerospace, electronic, optical, electro-optical, vacuum related as well as specialty OEM applications where the special blend of fast curing and high temperature resistance is desirable. EP65HT is available is various sizes and units to accommodate customer's needs.